Thinking of the perfect holiday gift for someone that has everything? How about some wonderful BC VQA wine? I see that there is a special promotion on gift wrapping now for some of these wines. Here is the info I received. Enjoy! The Wines of British Columbia have got you covered this holiday season with ready-to-gift BC VQA wines available at no extra cost in 10 participating BC Liquor Stores, from now until Christmas. As you read this press release, sheer organza wine-bottle gift bags are being applied to 10,000 bottles of BC VQA wines in select BC Liquor Stores, making it easier for BC wine shoppers to give the gift of wonderful wines, made in beautiful British Columbia. Whether for a BYOB party, a Hanukkah gathering, an office Christmas party or a dinner with family or friends, grabbing a gift-wrapped bottle of wine makes this year’s holiday shopping that much easier. What’s more is that the British Columbia Wine Institute has taken its promotional gift wrap to the next level of thoughtfulness, including a blank gift tag on every bottle to support a personalized gesture from each gift giver. BC VQA wines make the perfect gift anytime, especially this holiday season when they are all dressed up and ready-to-go! Best of BC Wine Tastings At BC Liquor Stores in October! This announcement just came out and there are some exciting, quality BC VQA wines being poured at BC Liquor stores in the Vancouver Lower Mainland and Victoria. Here is the announcement and some of their wines. Enjoy! With the fall harvest in full swing and Thanksgiving just around the corner, October is the perfect month to explore BC VQA wines. British Columbians are celebrating our local bounty and, what better way to honour our crops, than with the annual BC Liquor Stores ‘Best of BC’ release? Every year, BC Liquor Stores carefully selects a small collection of BC wines which are in limited supply and high demand. In the interest of fairness to all of their customers, the whole selection is released at once, and this year’s release takes place on Saturday, October 12, 2013 in Signature BC Liquor Stores across BC. It’s ‘first-come, first served’, so BC wine fans are encouraged to hurry down and snap up the very best that our province has to offer. In support of this annual release, the British Columbia Wine Institute has organized an extensive series of in-store wine tastings which will feature a variety of VQA wines from BC. From Vancouver’s West End to West Vancouver, from Victoria to Whistler, 12 different liquor stores will be home to sommelier-led wine tastings where customers can belly-up to the bar while doing their shopping, taste an assortment of BC VQA wines, and learn all about the vinicultural bounty that exists right here in our own backyard. October brings out the best wines our province has to offer with the ‘Best of BC’ release and province-wide BC VQA in-store wine tastings. Enjoy a glass of your backyard bounty this month! Ever so slowly people are starting to be able to order wines from wineries in other provinces. BC is wide open for business, while Ontario still has restrictions, apparently, to their consumers. I’m not going to go into each province and which wine they can and cannot purchase from other provinces. There are other articles out there that have this covered. What I would like to briefly talk about is one of the reasons I hear about why people should not be able to buy wines from wineries in other provinces. And that reason is that the provincial government where the person lives, will not get their provincial sales tax added to the wine, so the province will be losing out on revenue. From statistics that I read from the USA experience, 2% of wine sales are online, which doesn’t sound like a huge amount to me. Who is Buying Wine Online? If we look at the VQA wines that are for sale from wineries across Canada, I’d dare guess that most are in the $20 range or higher. Juxtapose this with the statistic that the highest volume wines sold in Canada are around $15. From this I am going to guess that these sub $20 wines are probably non-VQA and a fair number will not be produced in Canada. There are many southern hemisphere wines that you can buy in your local liquor store that are sub $20 for example. When purchasing a case of BC (or ON) VQA wine online I think most wineries ask for 6 or 12 bottle purchase. These wines I think would not be what the general sub $20 bottle buyers want to purchase. I think that the profile of the purchasers of these case and half cases would be people that have been to the winery before, possibly attend wine festivals and other wine events, and have a bit more disposable income. I could be wrong, but I think I’m pretty close. These $20+ wines would probably not ever be sold in a volume large enough for a provincial government liquor board to bring into their inventory, so no significant loss of income. Selling Wine Online Creating More Revenue? But here is another argument. Maybe these wines that are ordered online, creates MORE revenue to the government coffers in other items taxed, plus grows the economy for the private sector. What? How can this be? How are these wines shipped? By courier. The courier companies charge taxes for shipping, so there is tax revenue to the government, plus money to the courier companies, and wages to their employees. I think that companies like AMAZON and EBAY with all their online retail are helping courier companies and Canada Post with their volume of packages sold, plus as I mentioned the taxes on all those items shipped. Besides the couriers and Canada Post making money, there are all the other companies that make the boxes and packing materials to ship the wines. Again there will be taxes paid for these materials as well. So overall maybe opening up the provincial borders will do more net good to both the private and public sector, plus increase tax revenues. It’s worth a try! I was pleasantly surprised when I read about White Spot‘s commitment toward promoting BC VQA wines in their restaurants. I also had seen a tweet about it. Beside supporting BC wine, White Spot also sources local ingredients, so White Spot is a real home grown success. Their BC VQA wine list is at this link. The wines cover the major varietals of Chardonnay, Sauvignon Blanc, Cabernet Sauvignon, Merlot, and Syrah, and a few others. All wines are from the Okanagan. Here is their announcement. In celebration of summertime in beautiful B.C., White Spot today unveiled its 2012 seasonal Celebrate BC menu across the province, featuring summer dishes inspired by fresh, local ingredients. The return of Celebrate BC also marks the launch of White Spot’s new VQA wine list, making it the only casual dining chain in the province to offer a 100 per cent B.C. wine selection. “Since the first White Spot restaurant opened in 1928 we’ve been dedicated to using local ingredients in our menu as often as we can,” said White Spot President Warren Erhart. “Almost 50 per cent of White Spot’s ingredients, from tomatoes to potatoes, are locally sourced and we are proud to support the producers that grow delicious food right in our own backyard.” To create White Spot’s Legendary Burgers, fresh-cut fries and famous blueberry pies, more than 675,000 pounds of tomatoes, almost 5,000,000 pounds of Kennebec potatoes and 73,000 pounds of blueberries are used each year – all supplied by B.C. producers. This year the restaurant is deepening its commitment to local food and drink with its 100 per cent B.C. wine list. “By exclusively offering B.C. wines, White Spot boasts a menu that is truly made at home, showcasing the very best our province has to offer,” said Miles Prodan, Executive Director, British Columbia Wine Institute. 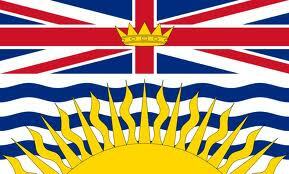 “The BC VQA designation guarantees 100 per cent B.C. wine. Paired with the Celebrate BC menu, White Spot’s new wine list is the perfect way to toast summer in B.C.” From now until early September, White Spot guests are invited to enjoy delicious new Celebrate BC menu items, including signature creations, like Truffled Mushroom Flatbread, Candied Salmon Cavatappi and Candied Salmon Spinach Salad. Please visit www.WhiteSpot.ca/CelebrateBC to view the complete menu. Have you heard of Niche Wine Co? Me neither, until very recently. There are many new wineries sprouting up here in British Columbia. 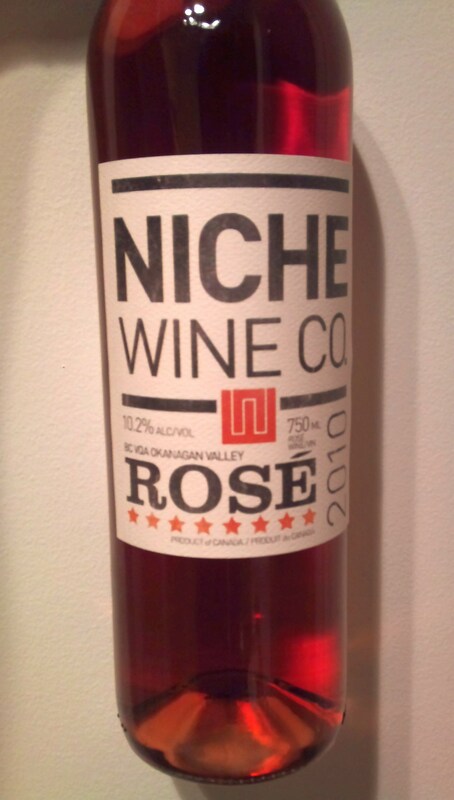 Niche’s Head Office is in Vancouver, and their winery in Kelowna. James and Joanna Schlosser are the owners. They are farm folk and love to make wine. You can find their winery high on a ridge in West Kelowna. All the grapes for the wine come from their vineyard, so very much a boutique winery. They currently are producing a rose and a Pinot Blanc. And I am told a Pinot Noir is on the way. Today I am trying their Niche Wine Co. Rose 2010. It is a blend of 59% Pinot Noir, 28% Riesling, and 13% Chardonnay. Very pale salmon in colour. Ripe tropical fruit, strawberries and red cherry aromas. Round, and soft mouth feel. Medium body with more red cherries and strawberry flavour. Medium plus acidity makes this a refreshing rose. Medium length with apples on the finish. I think the Chardonnay and Riesling add a bit of complexity to this rose. I don’t normally for example, think of tropical fruit when I taste a rose. A decent first attempt. I am curious to taste their Pinot Noir when it is released. I am one of the many Pinot lovers here in Vancouver. 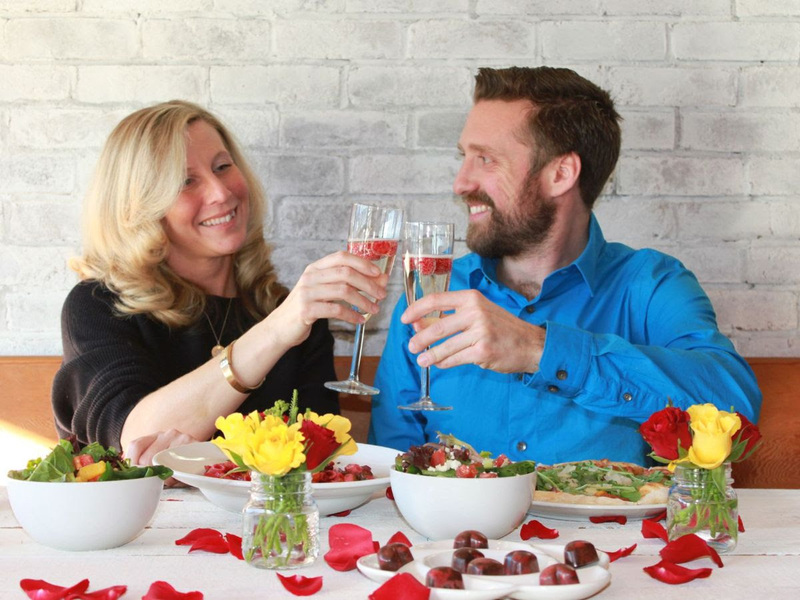 James and Joanna also recommend this Citrus Strawberry Salad Recipe to go with their Rose. One of the most popular BC wine events is the annual ChefMeetsGrape. The 7th Annual edition of this popular event here in Vancouver on Sept. 22. Many wine events are wine with bread and cheese. This event is excellent because restaurants will be serving appetizers paired with a BC VQA wine(s). Also, you have so many BC wineries from across BC here in one place. It is a great way to try wines that you may only have a chance to try if you drive to their winery. Take advantage of having the wineries come to you. Here is the announcement and details. Enjoy! ChefMeetsGrape, the largest annual celebration of BC VQA wines and local food, is once again coming to Vancouver! On Thursday, September 22, 75 BC wineries will be sharing their new fall releases, perfectly paired with inspired dishes from top Ocean Wise partner restaurants. This year, guests will enjoy wines from all of British Columbia’s five designated viticultural areas and sample dishes from top chefs from Vancouver, Whistler and the Okanagan. The restaurants in this year’s event, renowned for their delectable wine and food pairings, will compete for the honour of “Judges Choice”, as they each create appetizer-sized portions of a dish using BC ingredients, paired with their selected BC VQA wine. New this year is a critics’ choice raw bar (sponsored by the BC Shellfish Growers Association) featuring wine pairings from top BC wine writers and sommeliers. With over 250 award-winning Wines of British Columbia, 10 mouth-watering dishes, a critics’ choice raw bar, and the sultry sounds of jazz crooner Heidi McCurdy, this is truly an evening you and your tastebuds will never forget! Organized by the British Columbia Wine Institute (BCWI), Chef Meets Grape is proud to support the Vancouver Aquarium Ocean Wise program with 10% of all proceeds going towards their vital conservation efforts. Tickets are $85 (plus HST & s/c), and available through Tickets Tonight at ticketstonight.ca or by phone (604-684-2787). For up-to-date event details, visit winebc.com. If you have never attended Chef Meets Grape in the past in Vancouver, don’t miss it this year. It is a great time, with BC VQA wines and fantastic food from top Vancouver restaurants. Here is the announcement. Join us on Thursday, September 22 for the ultimate celebration of local wine and food at the 7th Annual Chef meets Grape! The largest annual tasting of BC VQA wines in Vancouver, over 75 BC wineries will be sharing their new fall releases, delectably paired with inspired dishes from 12 top Ocean Wise partner restaurants. With over 250 award-winning Wines of British Columbia, 12 mouth-watering dishes, and a critics’ choice raw bar (featuring wine pairings from top local wine writers and sommeliers), this is an evening you and your tastebuds will never forget! 10% of all proceeds will support the Ocean Wise program, promoting sustainable seafood in our restaurants. Come to sip, savour mingle and enjoy an evening of great BC wine, food and fun! Tickets: $85 (plus HST), with 10% of all proceeds going to the Ocean Wise program at the Vancouver Aquarium. Tickets are available online or by phone (with added service charges) through Tickets Tonight, or in-person at the Tourist Info Centre, 200 Burrard Street, Vancouver. What’s New At Hester Creek Estate Winery? Hester Creek Estate Winery in the South Okanagan has been slowly changing, putting several different pieces together, in the vineyards, the winery and around the winery, to put together a unique experience for their customers. I enjoyed a few hours with General Manager Mark Sheridan and winemaker Robert Summers talking about the winery and some of their wines. We met at Central Bistro in the west-end of downtown Vancouver. Central Bistro is cozy, they source local ingredients as best as they can, and try to showcase BC VQA wines. Hester Creek’s wines are on their list. One of the things that you will notice with their wines is the changing of their bottle labels. The new labels will be officially unveiled during the Vancouver Playhouse International Wine Fair in April. The new label still keeps the logo of Hester swimming after a fish in the creek, but it is now smaller, and bringing forward the name of the winery and varietal(s). It is very classy looking. Another related labelling item is that their back label will have a ScanLife code which you can scan with your smart phone / iphone and it will provide you with a flavour profile and food pairings. If you have not heard of a ScanLife code, it is a square shaped grid that can encode a significant amount of information. What is in the bottle is also very important. Winemaker Rob Summers described how they have improved their vineyards, installing drip irrigation, and now are using 100% Ganimede fermenters, which pump over the cap with their own CO2 produced during the fermentation process. These fermenters according to Rob makes brighter fruit flavours and softer tannins. Speaking about their wines, I was able to try two wines with Rob and Mark. The first wine was their Pinot Blanc 2009 ($15.99). It had aromas of flowers, peach and melon on the nose for me. Very vibrant fruit with medium acidity and a bit of roundness on the palate. A long minerally finish. I’d enjoy this wine this summer with some shellfish. The other wine was their Reserve Cabernet Franc 2008 ($25.99). Cabernet Franc grapes typically have an aroma profile that contains a cedar note. For some reason the Cabernet Franc grapes do not have this cedar component, and instead have raspberry and strawberry aromas and flavours. Something unique with their terroir, and that is what is so interesting about wines, and where they are produced. Their Reserve Cabernet Franc had a very fruity nose with raspberry, strawberry and some oak. Lots of bright raspberry fruit flavour. Medium acidity with a vanilla undertone and nutmeg spice. Medium length with a cherry / spice finish. In both cases, there was bright, vibrant fruit, and that is a character theme they want to have across their wines. The Next Chapter for Rob Summers is his “The Judge” ultra-premium wine. With this wine he wants to show that he has something special at Hester Creek, when the weather, terroir, and vineyard practices all mesh together. This wine is a blend of his best lots in the cellar of Cabernet Franc, Cabernet Sauvignon, and Merlot, to produce a wine that will age for several years. The wine from each grape is matured for up to two years separately, then are blended together and the blend is then further aged. Only 200 cases of The Judge will be produced. On top of the wines, there are 6 villas where you can stay, a stylish curved bar, an executive barrel room, a dining room, and a gift shop. And if you are a foodie, Hester Creek is offering a teaching kitchen that seats up to 14 people. Past chefs have included Chef Neil Taylor of Vancouver’s Cibo Trattoria, Chef Heinz Schmid of Kaleden’s Catering Done right, and famed restauranteur Umberto Menghi. That is Part 1 of my article on Hester Creek. Part 2 will be in summer this year when I visit Hester Creek Winery’s winery. I am looking forward to it. Enjoy!